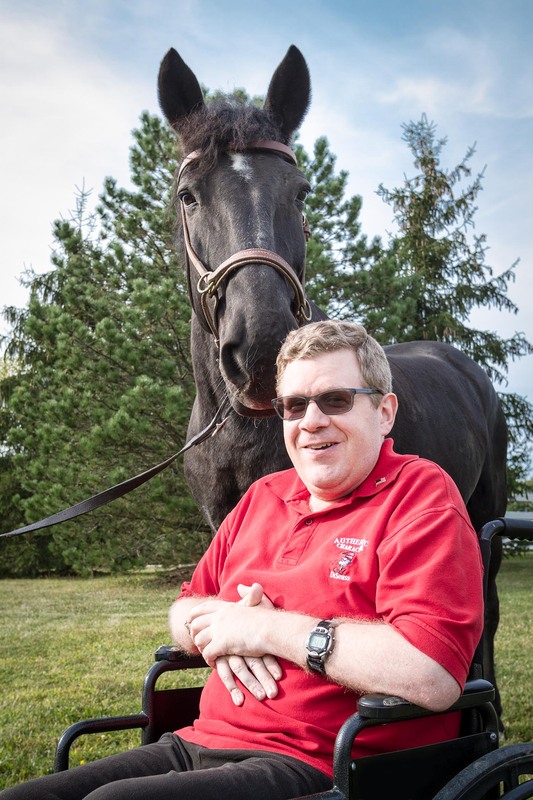 Every week for the past 36 years, Brian has been coming to Fieldstone Farm to ride, carriage drive, and work with our horses. And the smile that appeared the first time he rode at age six, persists at 41, as he drives our carriages and grooms our horses. Brian’s parents, Donna and Kevin, say the experience at Fieldstone has been incredible. Not only has working with horses helped strengthen his muscles, but it has also improved his posture, his speech, his attention-span, and helped him learn to follow directions and understand concepts such as colors and letters. Fieldstone also gives him an opportunity to socialize and make friends. Even when Brian has had a tough day, Donna says he is always very patient with the horses. She says he likes routine and typically doesn’t like transitions. But for some reason with the horses, it’s different, Brian is more relaxed and flexible, and accepting of change. Brian’s dad, Kevin, says the experience at the farm has been an important part of his life. His brothers and two sisters were competitive swimmers and brought home many trophies and ribbons. Riding at Fieldstone gave Brian the same opportunity when he would compete in the horse shows and bring home his own awards. To this day, Kevin says, Fieldstone Farm trophies adorn their home.